Spill pointed this out to me last night. The Afghani National Army has a tank battalion. Where did they get the tanks? They’re leftovers from the Russian invasion. The T-55 and the T-62 are archaic and obsolete compared to US armor. But facing an enemy lacking modern anti-tank weapons, they do bring considerable firepower to bear. When they can manage to get them running. Here at the 111th Division’s base, the Afghan National Army’s lone tank battalion has about 44 T-55 and T-62 tanks that are in some kind of working order. About 20 to 25 can actually be started and used at any one time. In early July at least eight tanks were deployed against Taliban forces in nearby Kapisa province, officials said. The T-55, first introduced in the early 1950s, was a mainstay of Warsaw Pact forces through much of the Cold War. Its simplicity, reliability and powerful 100 mm gun also made it popular with Third World armies that found it difficult to maintain and operate more sophisticated machines. The T-62, a development of the T-55 with a smoothbore 115 mm gun, followed in the 1960s. We’ve driven the Type 69 tank, an even more austere version of the T-55 built by China and operated by the Iraqi Army during Desert Storm. We would not like to have to fight from one. As the article notes, there simply is no supply of spare parts, nor even ammunition, flowing into the country. The have to scavenge and scrounge for parts. And while there are hundreds of derelict tanks in the country, that’s still a finite source of parts. Getting half of the battalion’s 44 tanks up and running is quite the respectable accomplishment. United States Air Force Capt. 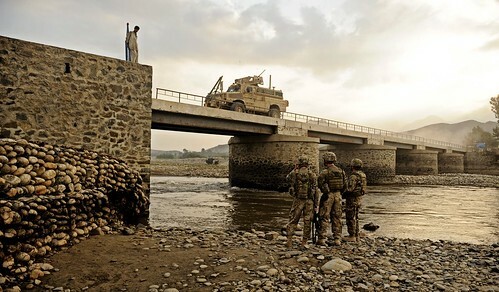 Jon Polston and Air Force 1st Lt. Scott Adamson, engineers attached to Laghman Provincial Reconstruction Team, inspect the underside of a bridge in Mehtar Lam, Laghman province, while traffic squeezes through the narrow pathway Sept. 7. The civil engineer team from the PRT traveled to the Jugi bridge in Mehtar Lam to asses the structural integrity following its recent completion, ensuring it will withstand the Afghan weather for years to come (Photo by Staff Sgt. Ryan Crane). The Mehtar Lam PRT is in the Regional Command -East sector of Afghanistan, not far from Kabul. The road infrastructure in that area reminds me of the “you can’t get there from here” network in West Virginia… “reminds” may be too strong a word though.